The Bentley Continental R was beautiful - coach-built, as it was, by London's HJ Mulliner, among others. But that was not all! It had a top speed of 124mph - making it the fastest 4-seater automobile in the world at the time. Mind you, it was a combination few could afford - in what was still post-war Britain. The Continental R was strictly for business magnates, movie stars and royalty. And the odd member of the landed gentry. The highest levels of comfort came as standard. 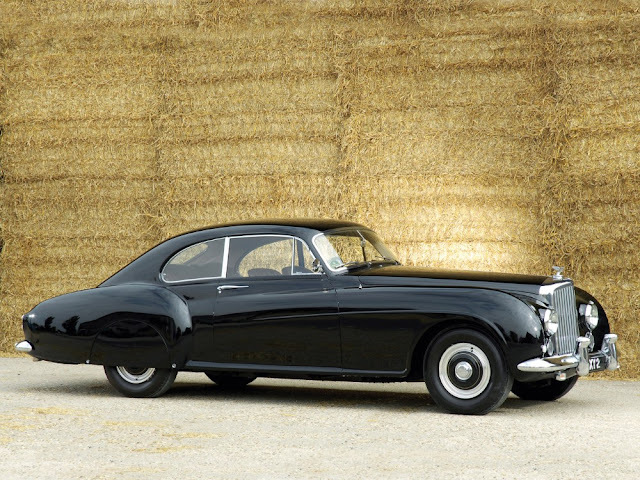 Put simply - in the early '50s, the Continental R was the best car money could buy! The Continental R's stately lines were refined in the Rolls-Royce wind tunnel - at Hucknall, England. John Blatchley was the stylist extraordinaire who oversaw the operation. When combined with HJ Mulliner's alloy body - and a one-off Supersports chassis - the result was a cutting edge coupé. Gearing was raised from that of the Bentley R - the Continental's less sophisticated predecessor. That meant long-legged power throughout the rev range. The straight six motor's compression ratio was also upped. And a big-bore exhaust system was introduced. As a consequence, the Continental's deep-breathing 4,566cc engine made light work of country roads. Aluminium bumpers, and alloy-framed bucket seats, helped keep the Continental's weight down - notwithstanding its gargantuan size. In austerity-ravaged '50s Britain, the name 'Continental' must have conjured up visions of exotic locales. Replete with cars like the 'R' sweeping majestically through idyllic villages, and rolling landscapes. Certainly, the car's interior was furnished for far-flung travel. The wide, wooden dashboard housed a rev counter, and oil temperature gauge. Such items had been considered surplus to requirements for the saloon version of the car. Only 208 Continentals were built. The Bentley Continental R was about as exclusive as a motor-car gets. But then - since it was at the top of its game in every department - it was always going to be that way!